Startup SG is an initiative by SPRING Singapore (SPRING), an agency under the Ministry of Trade and Industry responsible for helping Singapore enterprises grow. The Grand Finals of the inaugural edition of SLINGSHOT@SWITCH were held on 20 September 2017. It was held as part of National Research Foundation’s Singapore Week of Innovation & Technology (SWITCH) from 18 to 20 September 2017. The competition seeking the best innovative tech startups is powered by Startup SG. Startup SG is an initiative by SPRING Singapore (SPRING), an agency under the Ministry of Trade and Industry responsible for helping Singapore enterprises grow. It provides entrepreneurs with a launch pad and a platform to connect them to the global stage, and access to local support initiatives. 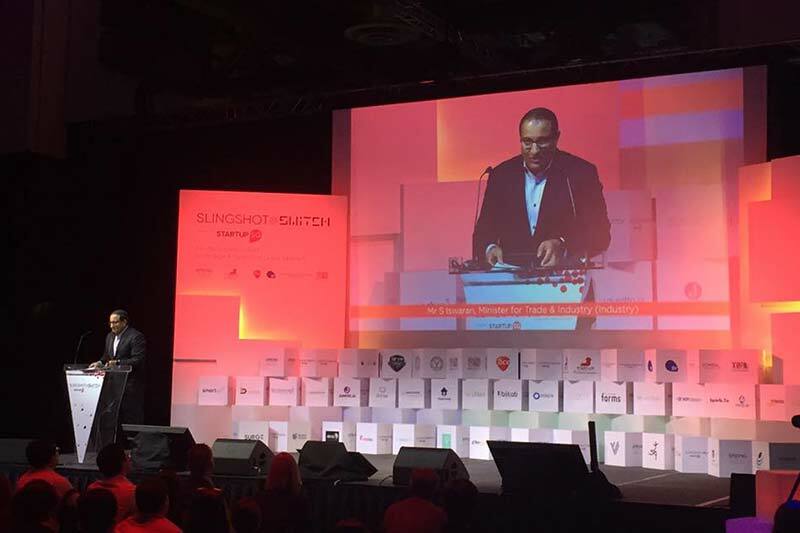 SLINGSHOT@SWITCH 2017 garnered participants from across the globe, with more than 900 applications from over 30 countries this year. Shortlisted startups competed in the Qualifying Round on 18 September 2017, where 21 teams emerged as the finalists. The 21 finalists were then joined at the Grand Finals by nine additional teams from partner competitions of SLINGSHOT@SWITCH, which include the Future Food Asia Award, e27 TOP100 Fight Club, Open Innovation Challenge in Healthcare, L’Oreal Innovation Runway and Global Health Innovation and Technology Challenge. US-based Sophie’s Kitchen won the grand prize of S$200,000 Startup SG grant. Sophie’s Kitchen Vegan Seafood, founded in 2010, is the first company to make plant-based seafood alternatives using innovative ingredients and patent pending technology. It is also the only meat alternative producer that is 100% gluten free, 100% soy free, all non-GMO project verified, and Kosher. Four other startups – BLITAB Technology (Austria), LPixel Inc. (Japan), Lucence Diagnostics (Singapore) and Smart Animal Husbandry Care or SmartAHC (Singapore) – took the runners-up prize of S$100,000 Startup SG grant each. All winners will be provided with up to 12 months’ free workspace at JTC LaunchPads. BLITAB® is the world’s first tablet for blind and visually impaired people. BLITAB is an affordable and multifunctional device for Braille reading and writing with one whole page Braille text. BLITAB® converts any document into Braille text – little smart dots (“tixels”) raise immediately from the surface and then fall down again. LPixel, a spin-out venture from the University of Tokyo, is a leader in advanced image analysis technology specialising in the life sciences field, including the medical, pharmaceutical and agricultural sectors. LPixel offers researchers top-tier image analysis solutions that integrate AI technology. Lucene Diagnostics combines deep technology with rigorous material design and software analytics, to provide unique proprietary blood testing today through its central laboratory specialising in Asian cancers. SmartAHC is a precision agriculture company, which develops smart devices for pig farming industry. Currently, the company has developed two products, the e-Doctor and Smart Ear Tag (SET). The former is a health and estrus (a regularly recurrent state of sexual receptivity during which the female of most mammals will accept the male and is capable of conceiving) monitoring wearable designed for breeding sows. The e-Doctor provides a heat detection accuracy as high as 95%, with the whole process done automatically with consistent results, based on its back-end algorithm that is based on artificial neuron network. The winners were selected by a panel of judges that comprised venture firms and multinational corporates such as B Capital Group, DeClout, Golden Gate Ventures, Google, KK Fund, Mistletoe, P&G, and Red Dot Ventures. Through SLINGSHOT@SWITCH, SPRING aims to add more vibrancy to the local startup ecosystem by providing promising startups with a platform to showcase their technology and business ideas. These global startups will bring unique and innovative skillsets, talent, and networks to bolster Singapore’s position as a leading startup hub.